AS ANYBODY who owns a home that’s been ofﬁcially designated “historic” knows, renovating such a structure comes with a host of extra challenges. According to Don Whitaker, one of the owners of the specialty building company, Test of Tyme, those can even include having to carefully number boards removed to get at wiring or plumbing so they can be put back exactly where they were. Most people’s dwellings don’t require that level of attention to detail, however, and can be more easily redone and restored to meet the owners’ needs. It’s often a simple — but not always easy — matter of dealing with tradeoffs between tradition and modern convenience. Whitaker should know. He has been employed in carpentry, cabinetry and custom millwork for more than 40 years. 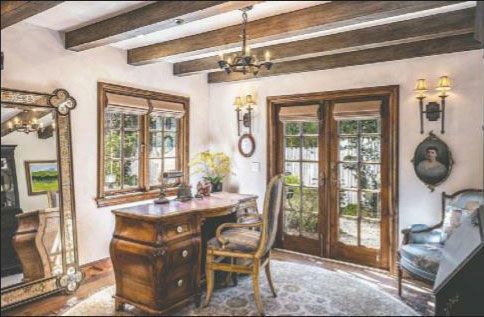 He works with his partners, craftsman Scott Coulter and real estate agent Susana DeFatima, along with an all-star team of local artisans, to restore old buildings and furniture to their original glory. 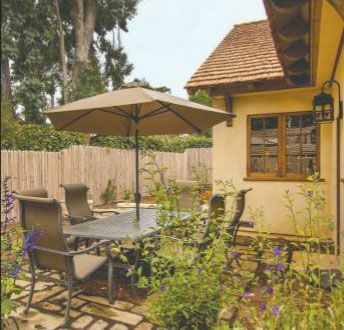 Test of Tyme’s website says that the organization has worked on more than 350 prestigious homes in the area, including 20 on the ocean side of Seventeen Mile Drive in Del Monte Forest. The ﬁrm specializes in restorations and ﬁnishes dating to 17th- and 18th-century Europe. And in addition to French country or old Spanish decors, they can work with other styles, like Victorian or Arts and Crafts, to capture the mood or feeling the owner wants. While George Washington or Robert Louis Stevenson may not have slept in your bedroom, antique architectural features or furniture may be worthy of some restorative attention, either from you or from a pro. How do you know when a project’s DIY and when to call in someone like Whitaker or one of his colleagues? Whitaker said it’s mostly in the eye of the beholder. “What’s your comfort level?” he asked, noting that some folks can learn enough from watching a YouTube video to successfully reﬁnish an old chair or table. Not good with your hands? With the popularity of TV shows like “Flea Market Flip,” where designers buy the ﬂotsam and jetsam of rummage sales and make it into furniture that sells for hundreds of dollars, such videos have proliferated online. Indeed, just one ﬁlm, “Chalk Paint for Beginners,” has garnered more than a million views in less than a year. However, if you’re not all that adept at working with your hands, or you want someone with knowledge of how things were done “back in the day,” then calling on a company like Test of Tyme makes sense. In an area where a lot of houses just evolved over time to meet owners’ needs, it can be hard to tell where the original “bones” of a place end and where modiﬁcations and additions begin. Whitaker said for most folks, that distinction is less important than how they want to live in the place. Frequent entertaining, for example, suggests a ﬂoor plan that’s open and amenable to the foot trafﬁc, while reading solo or canoodling à deux evokes something a little cozier. If you want to maintain a period feel to a room or house, some efforts can be trickier than others. Whitaker noted that environmental concerns in California have made selecting paints and ﬁnishes “interesting,” for example. Several counties have passed regulations on various chemical compounds found in paints and other household ﬁnishes, in addition to the state rules, and it’s helpful to have someone with experience in areas like that. He also noted that modern electronics — speakers, WiFi connections, and light switches that talk to refrigerators — often require an expert’s knowledge. And even though you might have all that fancy stuff, you can still cover it up. In the kitchen, for example, it’s entirely possible to disguise state-of-the-art refrigerators, freezers and dishwashers with wooden cabinetry. Carmelites are well known for their love of history. Restoration expert Don Whitaker and his partners respect that, while still making form follow function. Whether it’s a custom-made desk or an outdoor dining area with custom walnut windows, Test of Tyme makes spaces evocative and livable. For a true period feeling, ﬁnding the appropriate hardware is important. Whitaker said that while Restoration Hardware and similar businesses carry decent reproductions, dealers — especially in metropolitan areas like San Francisco — can often ﬁnd salvaged original claw-foot bathtubs, vintage light ﬁxtures, glass doorknobs and the like to ﬁt your style. And when something you treasure in your home wears out, there are still craftsmen working in cast iron, bronze, brass and so on, who can replicate what you once had. Wallpaper is another area that Whitaker said is “a vanishing type of art,” and, if you choose to use it, he strongly recommends hiring an expert to put it up. There are also trade-offs in terms of accessibility, convenience and energy efﬁciency. For example, he noted that a double-paned window will save energy, but it won’t have the same look and feel as an old single-pane model. He added that newer homes have become so airtight that they require fresh-air circulating systems to bring the ocean breezes indoors. What’s most important to Whitaker and Test of Tyme’s team is making the client happy. Along those lines, he spends a lot of time “giving people a good listen.” He also encourages people to collect photos and circle what they like, whether it’s a wall color, a staircase or a chandelier. Who knows? Maybe something in the real estate section of this very Pine Cone holds the key to a new (old) dining room. Best to have a look, don’t you think?